I’ve written before about my enthusiasm for Geoffrey Household’s classic chase thriller Rogue Male (see blogs passim). Most recently I passed on the news that there is to be a new film version starring Benedict Cumberbatch. However, it’s not the first time film-makers have tried to bring Household’s book to the screen. There was a television version on the BBC in the 1980s starring Peter O’Toole, which stuck very closely to the book. But long before that, in 1941, just before the United States entered the War, Hollywood had a go, though it changed some elements of the original story. The producers and the director, Fritz Lang, had something of a battle to get the story passed by the censor who – with the USA not yet at war – was frightened of upsetting Nazi Germany. The resulting film might have toned down some of Household’s original plot, but Man Hunt is quite stunning in its own way, particularly with Fritz Lang’s clever direction and the atmospheric black and white photography. There’s an edge of suspense that keeps the action rolling along. Hollywood studios seldom re-created London quite so well as here. We never learn the name of Household’s hero in the book, but here he’s Captain Alan Thorndike, played with gusto by Walter Pidgeon. Following a failed “sporting stalk” – and the target in the gun-sight is Adolf Hitler – Thorndike is captured by the Gestapo. We never see the scenes of interrogation, the torture and beatings are only hinted at, though very effectively. Thorndike escapes to London where he’s rescued by a beautiful street waif called Jerry (played with real poignancy by Joan Bennett). There is no such character in the novel, but she’s a great addition to the film. They are chased across London by Gestapo officer Major Quive-Smith, played with considerable relish by George Sanders in one of his finest performances – a truly believable Nazi – and a tall cadaverous man with a walking stick (John Carradine at his most menacing). These London scenes are particularly well done, particularly the chase through the London Underground, which is the first climax of the original novel. Gripping stuff! The photography, direction and editing, plus the seedy settings of dockland London and the Tube, give this part of the picture a film noir feel. In Household’s novel, his hero constantly considers whether his attempt to kill Hitler was just a “sporting stalk”, just to see if, as a hunter of big game, he could get close enough to the Fuhrer. Or did he always intend to pull the trigger and end the Nazi tyranny? This question, fundamental to the aim of the original story, isn’t ignored. Thorndike considers the answer until the end of the film, when the tragic consequences of his actions come to haunt him. The answer was very relevant to audiences in 1941, on both sides of the Atlantic. It has a relevancy today. A few months after the film was made the USA was at war with Germany. Hollywood fully joined the propaganda battle against the Third Reich, with movies good and bad. 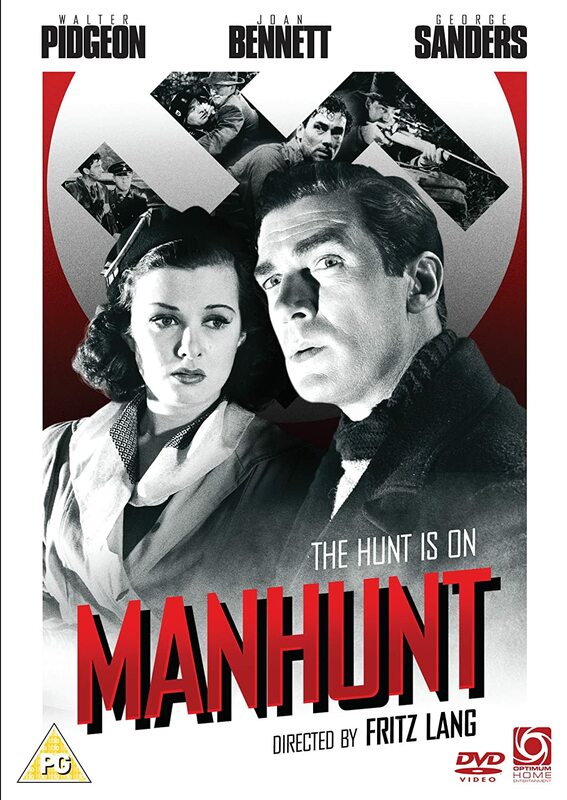 But Fritz Lang and 20th Century Fox set a very high standard, months earlier, with Man Hunt. Agatha Christie – and Hercule Poirot – entered the crime fiction world in 1921 with The Mysterious Affair at Styles. A year later, her second novel The Secret Adversary was published, the first of five Tommy and Tuppence Beresford stories. It’s interesting that Christie was showing her versatility so early in her writing career. Instead of building on her great success with a second outing for her Belgian detective, she took a new direction with new sleuths, this time a pair. The two novels are very different. The Secret Adversary is an adventure yarn. Much more of a light thriller in tone than a detective puzzle, parts of the plot are jolly far-fetched but who cares? I don’t, being happy to suspend disbelief for a good old-fashioned page-turner that’s lots of fun. This novel reminds me of some Margery Allingham titles – also much-enjoyed – such as Mystery Mile and Sweet Danger. These exciting, light-hearted romps seem out of fashion. Perhaps because they belonged to such a different time, less cynical and a far more rural England. Anyway, they’re still terrific reads and a relaxing escape from our modern age. To all those who lead monotonous lives in the hope that they may experience at second-hand the delights and dangers of adventure. Kindly meant of course but how times have changed. Can’t imagine any author today endearing themselves by suggesting their readers have dull lives. When we first meet our lovable duo, Tuppence is still Miss Prudence Cowley, the daughter of a Suffolk archdeacon and Tommy is her childhood friend. They haven’t seen one another since 1916, when Tuppence worked in an officers’ hospital in London and Tommy was sent there from France. Both recently demobbed, looking for work and dreadfully hard-up, they meet by chance in Piccadilly and decide to join forces. Over a council-of-war in a Lyons’ Corner House, they decide to form The Young Adventurers, Ltd and place an ad offering their services. Tuppence takes the lead in this enterprise, as she tends to do and the advert is never needed. Someone has been listening and adventure finds them shortly after. We’re off on a lively, racing plot with spies, a criminal mastermind and assorted sinister baddies, full of danger, excitement and fun. This reads like an early novel only in the sense that Agatha Christie captures the feeling of the time very well. It’s a story of bright young things, two resourceful people who are at a loose end. They’ve just been through the War to end all Wars and are left with no satisfying purpose or money. They’re looking for a role in life, preferably not too humdrum. 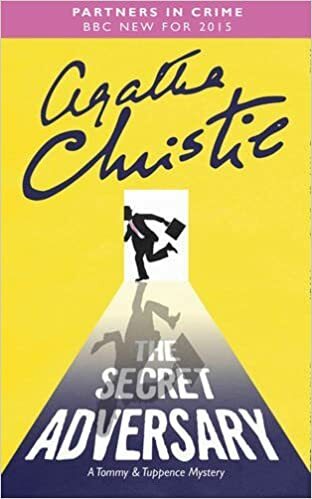 The writing of The Secret Adversary is as assured as any of Christie’s later work with an observant eye for characters, strong atmosphere and a dazzling twist. Tommy is in the best tradition of a pre-war Englishman, dogged, resourceful, brave, a gentleman and sportsman. Tuppence is the brains of the outfit, quick-witted, impulsive and liable to get herself in hot water. They’re both engaging and very real. Reading this again after decades, I can’t help ‘seeing’ James Warwick, Francesca Annis and Reece Dinsdale who played them so well in the 1985 LWT drama. A year earlier they’d also made the wonderful Partners in Crime, based on their second outing of short stories. Agatha Christie said that this was the series she most enjoyed writing. If you fancy curling up and escaping into a great adventure with lots of period charm – The Secret Adversary is one of the very best. My new novel, DEADLY QUEST, the second in the William Quest series, is now available for pre-order on Kindle at a special offer price. Publication day is Friday September 30th. The paperback version will be out at the same time. The price will increase that weekend so please do order today for the bargain price. And if you haven’t read the first novel, The Shadow of William Quest, it’s available both as a Kindle e-Book and in paperback. “A reign of terror sweeps through the Victorian underworld as a menacing figure seeks to impose his will on the criminals of London. On the abandoned wharves of the docklands and in the dangerous gaslit alleys of Whitechapel, hardened villains are being murdered, dealers in stolen goods and brothel keepers threatened. The cobbles of the old city are running with blood, as pistol shots bark out death to any who resist. Who can fight back to protect the poor and the oppressed? The detectives of Scotland Yard are baffled as the death toll mounts. There is, of course, William Quest – Victorian avenger. A man brought up to know both sides of the law. But Quest faces dangers of his own. 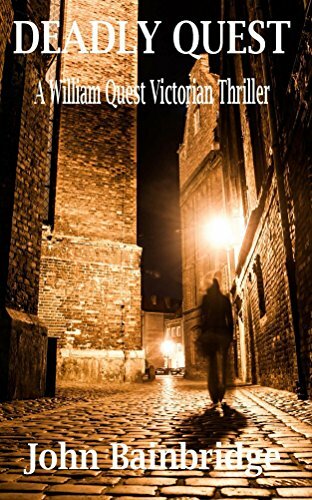 Sinister watchers are dogging his footsteps through the fog, as Quest becomes the prey in a deadly manhunt, threatened by a vicious enemy, fighting for his life in a thrilling climax in the most dangerous rookery in Victorian London. A page turner of a mystery from the start… I couldn’t put this one down for long as I was caught up in the twists and turns of this richly constructed tale. Great author, fantastic book. Such a unique story and very well told. A new hero for these times has entered literature, and is destined to capture the attention of all those yearning for a better chapter within the human saga – it is William Quest. Great read! Couldn’t put it down. …a real feel for history and storytelling. 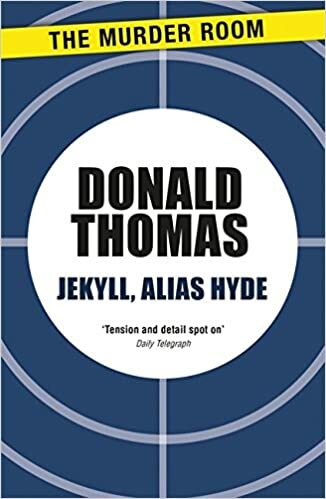 Donald Thomas’s novel Jekyll, Alias Hyde, is described on its title page as “A Variation”. And so it is, in every sense of the world. Donald Thomas re-imagines Robert Louis Stevenson’s classic, The Strange Tale of Dr Jekyll and Mr Hyde, from the point of view of the police detective investigating the murder of Sir Danvers Carew, slain by Hyde in Stevenson’s original. The police officer is Inspector Alfred Swain, who features in several other novels by the same author. He is assisted by the argumentative Sergeant Lumley, and supervised by Superintendant Toplady. The dynamic between the three is quite wonderful, often combative, and occasionally very funny – the passages where the three inter-react would make the book worth reading even if there was no other plot. For readers who are unfamiliar with Donald Thomas’s non-fiction I’ll just mention that Thomas is a very noted biographer and historian. His account of The Victorian Underworld, has achieved classic status. Thomas knows all there is to know about Victorian crime and society. It shows here, as he presents a Victorian scene you can almost climb into. In this re-imagining of the original story, Thomas’ detective is already involved in the story before the murder, as he is on familiar terms with the solicitor Utterson, who is Dr Jekyll’s solicitor. Swain also has an infatuation for Utterson’s daughter. And through this connection we enter the strange world of Dr Jekyll and, eventually, Mr Hyde. Much of Victorian London is portrayed with stunning accuracy, from the miserable slums to the fashionable salons of the West End. And just what is the mysterious connection with the Zulu Wars? This is, first and foremost, a crime novel. The victim, as in Stevenson’s original, is the politician Sir Danvers Carew. Stevenson never quite explains just why Carew is murdered. But Donald Thomas does, in a particularly convincing plotline. But who else knew why such an apparently harmless man was killed? And how reliable is the only witness? And just who is Edward Hyde? We think we know, especially if we’re familiar with the original story, but can we be sure? I don’t ever give spoilers, for this is a book you should seek out for yourself. Sufficient to say, that Donald Thomas plunges us into a very familiar tale and then turns our expectations upside down with his “Variation”. This very skilful author has written a literary detective story that is first-rate. For anyone growing up in England during the middle years of the 20th century, the name of writer Francis Durbridge, in connection with mystery writing, was an indication of twists and turns, considerable cunning, and particularly fine writing. Durbridge was very prolific and, although he wrote fiction, his greater reputation was as a scriptwriter for films and television. Throughout those decades, UK audiences would cancel appointments to make sure they were in when the latest Durbridge mystery was aired on our TV screens. 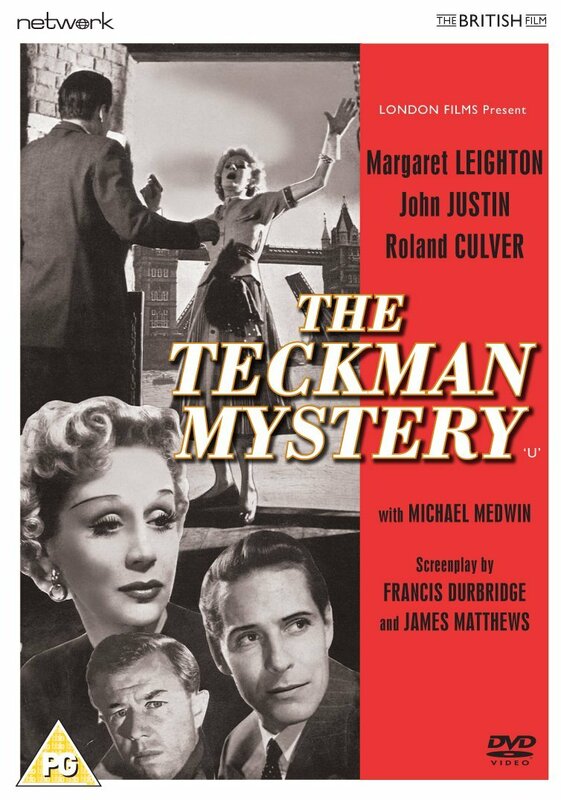 The Teckman Mystery, though, is a film, suggested by Durbidge’s original story The Teckman Biography. It features one of his regular characters the crime-writer Philip Chance, played in this 1954 production by John Justin. As the film begins, we meet Chance flying back to England from his villa in the south of France. He is returning to London to meet his publisher, who wants him to write a biography of Martin Teckman, an airman who has died testing a new aircraft, though his body was never found. By coincidence, on his journey to England, Chance meets Teckman’s sister Helen (Margaret Leighton), who seems puzzled by the death of her brother. Now, I’m not going to give away much else of the plot, for Durbridge deserves to be seen with no spoilers. Enough to say, that, as so often with Durbridge stories, nothing is quite what it seems to be. Which characters can be trusted, and who are your real allies as opposed to enemies. A series of “accidents” beset the would-be biographer of Teckman, leading to attempted bribery, burglary and murder – but who wants his investigation into Teckman’s accident hushed up? And just why are Scotland Yard and MI5 so interested in Philip Chance’s inquiries? Watching the Teckman Mystery is a very enjoyable way to spend a rainy afternoon. Just over a month now to the publication of the sequel to my novel The Shadow of William Quest. The new title will be available for pre-order at a special price a little while before that, so do keep visiting the blog for all the latest news. From now until then, I’ll be putting out a few items both about the new book, and the first in the series. I’d long wanted to write a book set in Victorian times, not least because much of the Victorian world is still familiar to those of us living in the UK. As we wander through the streets of Britain we can – if we lift our eyes above the modern fascias on the shops – still see what our Victorian forebears saw. If we could travel back in time, we could enter the world of William Quest – the new book is set in 1854 – with little difficulty. Though there would be some surprises. It could be a brutal world, not as settled as some people have implied. There are many Victorian Values that deserved to be relegated to the history books. My William Quest is a bit of a reformer. His ideas bore fruit, though it doesn’t always seem like it. For quite a time, I moved away from Victorian history, into other periods. As some of you will know, I also write historical novels about Robin Hood – Loxley and Wolfshead, with a third book out next year, so I have a passion for the that period. For a long time I’ve had an interest in the English Civil War. I like the Anglo-Saxons too. Then, nearly thirty years ago I became an undergraduate of the Open University, doing an arts course that was almost entirely Victorian. After a couple of years, I went as a full-time undergraduate to the University of East Anglia. My major was literature, though I did a minor in 19th century social history, some of which looked at the Victorian underworld. It all stayed in my mind, though work pressures kept the writing of fiction at bay. I did, however, write the texts for a series of topographical books about the towns and landscapes of England. 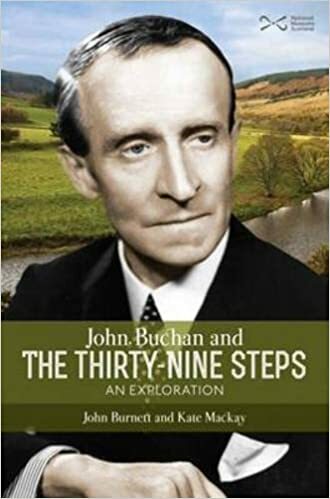 John Buchan’s classic thriller “Greenmantle” – first published a hundred years ago this October – is the second of his novels to feature the character Richard Hannay, whom Buchan introduced in “The Thirty-Nine Steps” (see blogs passim). The plot covers an attempt by the Germans, for their own strategic advantage in World War One, to persuade the Turks to participate in a Jihad against the Allies. This makes it singularly relevant for modern times, when the word Jihad is constantly banded about. (Jihad is usually interpreted as meaning the summoning of a holy war; it actually means working for Islam in all sorts of ways). The book starts with Hannay, recovering from wounds received on the Western Front, being summoned to see spymaster Sir Walter Bullivant (from “The Thirty-Nine Steps”), who gives him a slip of paper with three very slender clues, and then despatches him to discover their meaning. Hannay, disguised as a South African of Dutch origins, makes a perilous crossing of Germany, partly in the company of the Boer Peter Pienaar, and the American John Blenkiron. In my view these German-set passages are the most interesting in the book. While the chief villain, von Stumm, is portrayed by Buchan as something like the baddie of anti-German propaganda of the time, the rest of the Germans are represented with considerable sympathy. Which is quite surprising for a British writer in 1916. Hannay, in his disguise, is introduced to the Kaiser, whom Buchan portrays with surprising understanding, showing him as much a victim of events as anyone else caught up in the Great War. He also gives us a German engineer called Gaudian, whom Hannay likes very much (he reappears in the later Hannay adventure “The Three Hostages”). Even von Stumm is shown as a balanced figure – you can see where he is coming from. There are passages where Hannay is ill and given shelter by a German family, and a chapter where he works in great harmony with the German captain of a barge travelling down the Danube. Hannay learns from his experiences that the horror of the war is that it often pits decent people against each other. Given the anti-German propaganda of the time, this is all the more remarkable. Buchan has too often been labelled as a racist and anti-Semite (usually by people who’ve never read him). He is neither. His humanity shines through his work. If his characters sometimes use expressions that sound uneasy on the modern politically-correct ear, it is because that is the way people spoke at the time. And the views of a writer’s characters do not represent what the writer might believe anyway. In this book we are introduced to Sandy Arbuthnot (based mostly on Buchan’s university friend Aubrey Herbert.) Sandy is a master of disguise, a man who has lived rough in many parts of the east, and can pass himself off as a native in many countries. The character might sound far-fetched, but the real-life Aubrey Herbert did all of that and more. Peter Pienaar is a hunter from the African veldt, a simple man of great courage. Blenkiron abandons the American neutrality of the time to work for the Allies. Buchan was very fond of Americans and this character is a tribute to many friends. The other villain of the piece is the German agent Hilda von Einem, who has an obviously sexual obsession for Sandy Arbuthnot, even as he is thwarting her plans to inspire Jihad. Eventually the four heroes of the book find themselves in Constantinople, a city portrayed in a very claustrophobic and threatening way. Here they discover the secret of Greenmantle, before journeying to the front line in the war, at Erzurum, where the Germans, Austrians and Turks are fighting off a Russian advance. Buchan shows sympathy for the Turks, despite the fact that they are Hannay’s enemies. Sandy is shown to have a considerable empathy with the Turkish people. The novel ends with our heroes surrounded and fighting against massive odds. I won’t say more because I think you should read “Greenmantle” for yourself. But I think it interesting that Buchan, against the fashion of British thrillers of the time, is not afraid to make Hannay and the others scared. John Buchan was a great writer in so many ways. He is particularly good at describing landscapes, taking the reader right in there with his characters. You really feel you have undertaken Hannay’s journey across Europe to Turkey. A century on, “Greenmantle” is still an exciting read. More than that, it is prophetic, given the circumstances of the modern world. Before he established his reputation with the “Dalziel and Pascoe” series of detective novels, Reginald Hill wrote several standalone thrillers under the pen-name Patrick Ruell. Many of these have been re-published over the years under his own name. “The Long Kill”, mostly set in the Lake District, is the story of Jaysmith, a hired assassin working for a shady department of the British government. Jaysmith’s technique is the long kill, taking out his target with a rifle from a considerable distance. He has a reputation as a hit-man that is second to none. But when he is sent to the Lake District to shoot a victim sitting in his cottage garden, he misses – for the first time ever. Jaysmith has already been told that his eyesight isn’t quite what it used to be. Missing the shot persuades him to retire, seemingly to spend the rest of his days peacefully fellwalking in Lakeland. But, of course, retiring from shady government departments isn’t quite as easy as all that. Jaysmith has a sinister boss, Jacob, who is none too keen on the prospect of losing his favoured killer. It gets even more complicated when Jaysmith finds himself getting romantically involved with Anya, the daughter of the man he was sent to kill. And that relationship provides much of the mystery of the novel. His target, Bryant, seems to be just a country solicitor. Jaysmith is baffled as to just why his paymaster would want the man dead? Jaysmith finds himself in the position of defending the man he was sent to kill, threatened by other hit-men from Jacob’s department. The book comes to a particularly tense and dramatic conclusion, which leaves you on the edge of your seat. The ending will live in your mind long after you’ve closed the book. “The Long Kill”, which is full of moral ambiguities, has a wonderful Lake District setting, mostly based around Grasmere and St John’s in the Vale. Hills and valleys where killers might be so easily concealed. The author makes even Keswick seem a threatening place to be. Reginald Hill is very good at summoning up the atmosphere of the Lakes. He never just parachutes in local colour. You get the Lakeland fells and villages as they really are in a way few other others can match. The scenes where Jaysmith goes fellwalking are superbly written, as a fellwalker myself I can attest to their accuracy. “The Long Kill” is thriller writing in the classic tradition – the tale of a man who lives outside the law, but is sanctioned by sinister forces within it. Not quite the tale of an innocent in peril, given Jaysmith’s background as a hired killer, but the story of a hero who tries to bring order to a chaotic world that is beyond his control. Interestingly, Reginald Hill revisited some of the same themes in his masterpiece final novel “The Woodcutter” (see blogs passim), also drawing in elements from his other early novel “Fell of Dark”. “The Long Kill” is a particularly visual novel, its scenes leaping out from its pages. It would make a terrific film. Mornings only! An early start and then only to lunchtimes, then the brain gives up. I usually write between 850 to 1400 words a day. I try to write every day. I really want to do more words. I hope to finish another Quest novel by the spring. The sequel to my historical novel “Loxley”, which is scheduled for publication next month. 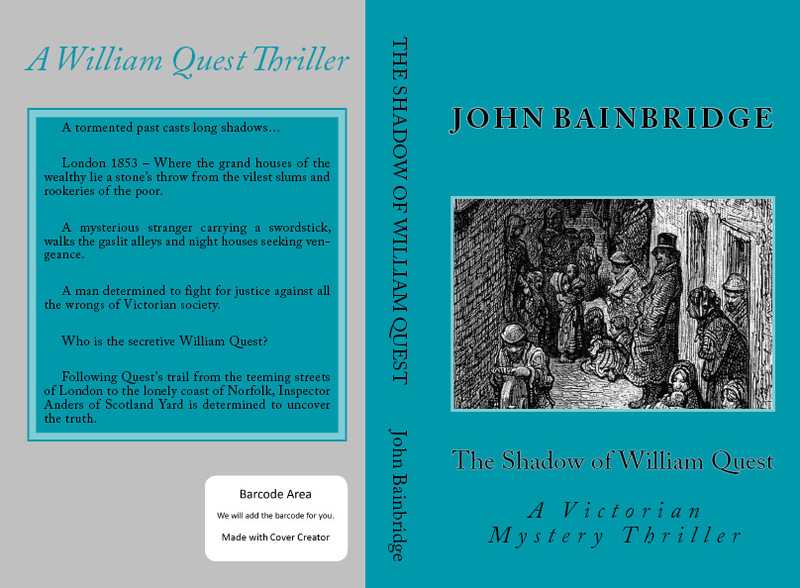 “The Shadow of William Quest” is now out in paperback and on Kindle, Kobo and Nook eBook readers. Just click on the link below for more information.